Those who prefer the advantages of a small car will enjoy shopping for their new vehicle. While SUVs continue to sell exceptionally well, manufacturers haven’t neglected the small car category. Where once a small car was purchased in an attempt to reduce operating costs, vehicles in the category are now considered an informed choice as the result of being both practicable and enjoyable to drive. When a company’s guiding philosophy is “Driving Matters” good things happen. The Mazda3 is intended to be the first choice for those who enjoy driving. The car is frequently cited in reviews for offering a driving experience that evokes that of premium sports sedans. Hyundai have devoted the past decade to their quest to challenge the best in the category. The Elantra is now one of the top selling cars in Canada, which suggests that Hyundai have spent their time wisely. Honda may have over-reached with the styling of their new Civic, leaving some of their faithful customers behind. No matter, Hyundai has just the car for them in the Elantra. Mazda approaches design and engineering from a unique perspective. KODO (Soul of Motion) design influences all Mazda design. The Mazda3 is arguably the most attractive entry in the segment, offering a quiet confidence with a hint of athleticism. The Mazda3 can be enjoyed as a Sport (hatch) or sedan model. Hyundai has given the Elantra pleasant and pleasing bodywork. Where once the company tended to over-style their vehicles, the current generation of offerings are clean and contemporary. The Elantra is also offered in hatchback and sedan versions, with the sedan being the better looking of the two options. A choice between two engines is available in the Mazda3 range: a SKYACTIV-G 2.0L inline 4-cylinder (155 horsepower and 150 lb. ft. of torque in GX and GS models). The Mazda3 GT is fitted with a SKYACYTIV-G 2.5L inline 4-cylinder (184 horsepower and 185 lb. ft. of torque). Owners have their choice as to how gear changes are accomplished. Those who prefer a gear stick will opt for the SKYACTIV-MT 6-speed manual transmission. A SKYACTIV-DRIVE 6-speed automatic transmission with manual-shift mode, Drive Selection switch and paddle shifters will be the first choice of those whose only experience of a clutch is a soft leather purse by Valentino. Hyundai’s Elantra also offers a choice between two engines. A 2.0L inline 4-cylinder (147 horsepower and 132 lb. ft. of torque) is the standard engine. A 1.6L Turbo (201 horsepower and 195 lb. ft. of torque) is found in Elantra Sport models. Transmission choices include a 6- speed manual, 6-speed automatic, and a 7-speed dual-clutch transmission, depending on the model selected. KODO influences all aspects of Mazda products, including interior design. The interior of the Mazda3 reflects the ethos of this thinking. The interior of the car immediately gives the impression of having been sourced from the near-luxury market. Trimmed in quality materials that provide both tactile and visual pleasure, the cabin is intended to remain comfortable on the longest journey. Rear seating comfort in the Mazda3 has been criticized for being narrow, a not uncommon complaint in this segment of the market. Compared to the Honda Civic, the Elantra is an exercise in conservative style. Not that this is necessarily a bad thing. Everything is where it’s expected to be, and the materials used are pleasant to both the hand and eye. 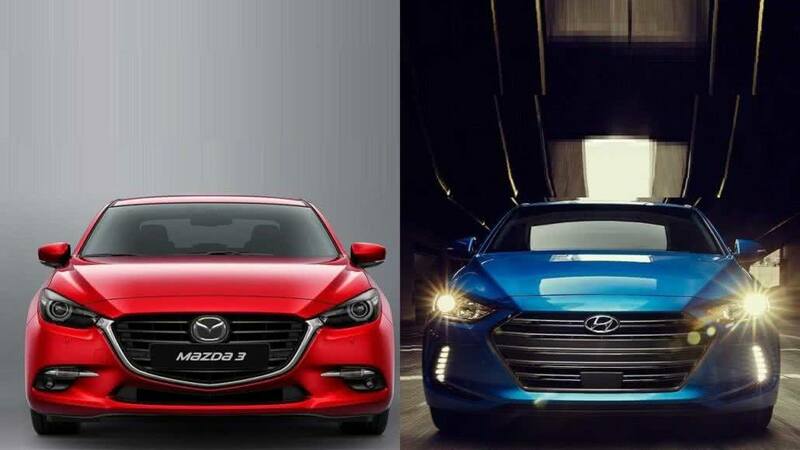 The Elantra has moved closer to its larger sibling, the Sonata, in quality. On the practicable side, there are plenty of storage cubbies to store life’s necessities. “Driving Matters” is the touchstone of Mazda experience. Mazda’s range of SKYACTIV technologies have resulted in the best handling vehicles in their respective market segments. Already a class leader in vehicle dynamics, the Mazda3 now benefits from G-Vectoring Control. Worthy of the Automobile Journalists Association of Canada’s 2017 Best Innovation Technology Award, G-Force Vectoring enhances handling by making small adjustments in engine output, which places more weight over the front wheels. Quietly working in the background, G-Force Vectoring provides another level of sophistication to the Mazda3 driving experience. Hyundai has spent time reconsidering the Elantra’s handling characteristics. Previous models weren’t noted for their sublime road manners, with quotes such as “inconsistent-going-on-demented ride” not helping to attract customers. Revised suspension components in the rear of the car have made a significant difference to the car. The Elantra will endear itself to many with its now compliant and predictable handling. What it won’t do is engage with those who ask just that little bit more from their car when it comes to driving enjoyment. The Hyundai Elantra is a logical progression of a good car. This is a well-considered car that provides adequate power in a stylish package. Hyundai has made good on their mission to challenge the best in the category. This is a car that will appeal to a wide audience, based on the inherent value on offer. Handling has been improved over previous versions, but not to the extent that it will be the first choice of the driving enthusiast. Stylish and well-equipped, the Elantra will continue to do well in the category. The Mazda3 is best experienced first-hand. Few cars, even at a considerably higher price-point, offer such balanced and engaging handling. Those who find joy in roads that aren’t the shortest distance between two points will appreciate Mazda’s commitment to building cars for drivers. It wouldn’t be wrong to consider the Mazda3 as a sports car. Just one that conveniently has two extra doors. Zoom Zoom indeed….